The arrival of Amazon is shaking up the Australian market. More and more Aussie shoppers are continuing to abandon bricks and mortar stores in favour of online shopping, as businesses fight to compete against the impending arrival of global giant Amazon. 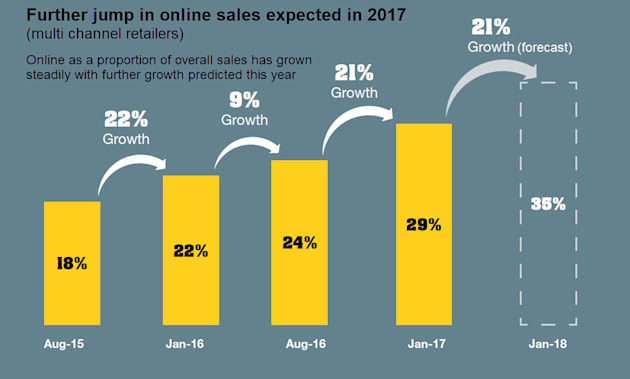 One third of all purchases at multi-channel retailers will be made online by the beginning of 2018, new research by the Commonwealth Bank indicates. That figure currently stands at 29 per cent. National Manager of the Retail Industry at Commonwealth Bank, Jerry Macey, said that retailers consistently underestimate Australians' demand for online shopping. Businesses are working on improving their customer service to compete with Amazon when it arrives next year. "Retailers maintain a bullish outlook for online sales and yet may be underestimating future growth, as they have previously," he said. Multi-channel retailers -- that is, stores who sell both in bricks and mortar stores and online -- forecast a 24 per cent growth of online sales last year, while they in fact grew by 32 per cent. The findings follow Amazon's March announcement that they will be setting up in Australia in 2018, with the promise of cheap goods, faster delivery times and access to a huge range of products, including groceries and streaming of TV shows and movies. That's good news for consumers, but risks upheaval among traditional Australian retailers -- many of whom aren't prepared for Amazon's launch. Amazon has been dubbed the 'country killer' by analysts at Morgan Stanley, yet many Australian retailers remain optimistic in the face of the retail giant's arrival. Online sales will make up more than one third of all Australian sales in 2017. Only 20 per cent of all retailers expected conditions to worsen in 2017, while 34 per cent thought conditions would improve, according to the Commonwealth Bank Retail Insights Report. That was largely due to their own increased innovation and improvements in business strategy, rather than any improvement in the market. But Macey said that, with the right approach, Amazon can actually be an opportunity for growth among existing retailers. "There is significant potential for more retailers to look at third party sites as a viable sales channel, rather than adopting a purely defensive stance (towards Amazon)," he explained. Interestingly, retailers are turning away from the more established methods of drumming up business online of email, social media advertising and mobile apps, instead focusing on interactive approaches to build loyalty. This includes live chat and increasingly advanced chat bots. Chat bots are a relatively new tool for shoppers. Sites like Facebook allow businesses to build their own chat bot -- bots which "talk" to shoppers, place orders for them and respond to requests for information. Not only will they order your pizza for you; they can also remember your past order and payment details and send you restaurant suggestions based on your location. If you've got a complaint, they can also transfer you over to a real person to deal with your concerns. Improving delivery times will also be key for retailers seeking to compete with Amazon Prime, a service where customers pay an annual fee of about $100 for free delivery in as little as one hour. Around 60 million American households have signed up for Amazon Prime. One way retailers have been doing this is through 'Click and Collect' -- where you can shop online and collect in-store at a time that suits you. The number of retailers offering 'Click and Collect' has doubled in the past 18 months, with 42 per cent of retailers now providing the service.